More than two decades into a 70-year sentence, Jim Duncan maintains his innocence. The central Florida man is serving time for aggravated child abuse. He was convicted of the crime after he and his wife brought their infant son Kody to the emergency room when they noticed he was in pain and not using the left side of his body. The doctor found 13 broken bones and a skull fracture in his X-rays, but no bruises. He called the police. "I am innocent," Duncan told CNN's Jean Casarez. "I did not harm my son." Duncan is hoping a new lawyer, and new medical science, will end his nightmare and bring him home. His lawyer is taking his case to the 2nd District Court of Appeals in Florida next week, and he is hoping for a new trial. Illinois radiologist Dr. David Ayoub said he believes Kody had infantile rickets, a disease of early life in which bones do not mineralize properly. Ayoub said he believes this led Koby to develop metabolic bone disease, causing Kody's bones to be very fragile. With that diagnosis, Florida Defense Attorney Lisabeth Fryer is working to get Duncan's conviction overturned. This is an heartbreaking story. Jim should be freed. I had an experience with my son, several years ago, with a different ending. I had my son John, at nineteen. He was a healthy baby until at 13 months, he started having fractures, with no apparent cause. I took him to a General Practice. and was put in casts for the breaks. After a few months, the Dr referred us to an Orthopedic specialist. He diagnosed my son with osteogenesis imperfecta, and advised us to put him in a Crippled Children's Home in Chino, Ca. He was there for 3-4 months, getting care with nutrients and vitamins, No more fractures. This was such a difficult situation for me, as a single mother. My father was there for me at least. At least this was a totally different ending for me. I was never accused of child abuse, maybe since I was the Mother, or it was a different time. Child abuse cases have gotten more attention in the past 30-40 years. I feel very lucky, after reading of Jim's case. My son is 63 yrs old, has been strong healthy all his life. I hope this helps, and gets some attention in Jim's case. He diagnosed my son with osteo-perfecta which was described as an imperfect bone condition. At the time I was a single Mother working to take care of my son, with the help of my father. The Dr. suggested I have my son put in a crippled children's home for a while to be cared for. That home was called Casa Colinda children's home in Chino, Ca. This was a heartbreaking experience, since he was just a baby, it was so hard for me. He was in the home for about three months. No breaks, but was confined and given nutrients and vitamins, that's all. Afterward he never had another broken bone, has been healthy and strong all his life. 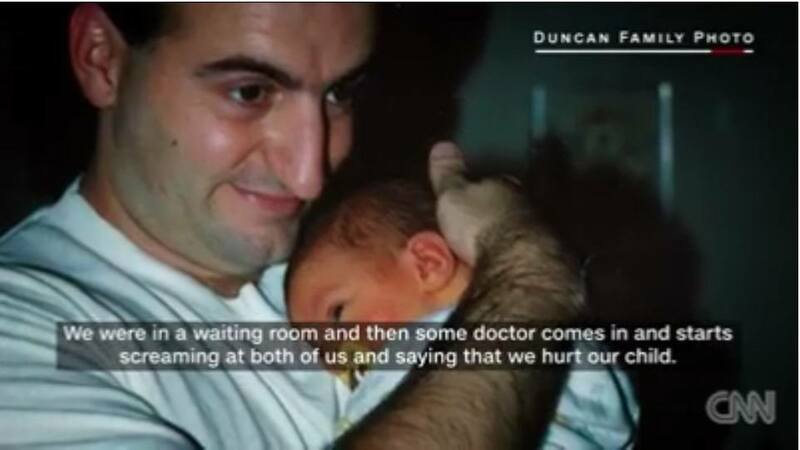 He is now 64 yrs old, Looking back on my experience, I feel that I was so lucky to not have been charged with child abuse, maybe because I was the Mother, also my Dad was there, so I feel that what has happened to Jim Duncan and his son is in fact a similar experience to mine. I was just very lucky at that time. Also because in the last 50 Yrs or so, there so many child abuse cases being brought to court. The diagnoses that I was given at the time was probably not correct, since my son didn't continue to break any more bones. I always thought it was something different, similar to Kody's diagnosis. By the way, he had 13 fractures, some had healed on their own, the others had casts.